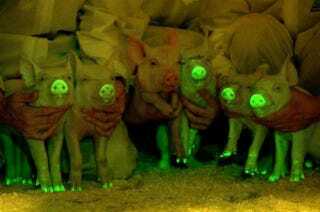 Though they may not be the first set of glow-in-the-dark critters born for the sake of science, the newly bioluminescent pigs of the South China Agriculture University aren't any less incredible—or for that matter, adorable. Wilbur, eat your heart out. And as far as the pigs are concerned, looking good is pretty much their entire job. Just like the rave-ready rabbits that came before them, the pigs were injected with jellyfish DNA when they were tiny embryos for the sole purpose of seeing whether or not the glow factor would take. Because now that we've seen that both rabbit and pig embryos hold the potential for genetic manipulation, any future human application is looking far more likely. It's just a marker to show that we can take a gene that was not originally present in the animal and now exists in it. The green is only a marker to show that it's working easily. [For] patients who suffer from hemophilia and they need the blood-clotting enzymes in their blood, we can make those enzymes a lot cheaper in animals rather than a factory that will cost millions of dollars to build.